Well, I think it’s fair to say the first Tired Old Hack Game Club was a success. Well over a hundred people joined throughout the course of the month to take part in a Zelda II playthrough, helping each other out along the way. Many even finished the game for the first time, commenting that were it not for the Game Club they probably wouldn’t have managed it. Which is lovely to hear. With that in mind, let’s do it all over again. In case you missed out the first time around, the Tired Old Hack Game Club is a new group in which, for a month at a time, like-minded gamers can play through retro games together. Instead of trying to decipher a potentially troublesome retro game and figure out what makes it tick by wading your way through terrible online FAQs written by 13-year-old amateur comedians, you’ll instead be able to take comfort in the fact that a bunch of other folk are also playing through the same game as you, and you’ll be able to talk to them about it. Stuck in a particular area? Struggling to get to grips with the game’s mechanics? Found a particularly cool trick and want to share it? Have you drawn your own map to help you get through a dungeon, and you want to proudly offer it to others to help them? This is for you. Each month yer man Scullion will pick a retro game for everyone to play together. These will almost always be games that are easy to get hold of and affordable: I’m not going to ask you to buy an Atari Jaguar and drop £80 on Alien vs Predator or anything like that. Ideally, nothing in the Game Club will cost more than £10. Anyone wishing to take part in the Game Club will be able to join the discussion on the Tired Old Hack Discord server. If you haven’t already joined or are new to Discord, it’s essentially just a chat room with various channels: the Tired Old Hack one has channels dedicated to the site itself, Nintendo games, Xbox games, PlayStation games, retro gaming, off-topic and the likes. As of right this bloody moment, the Tired Old Hack Discord server now has a shiny new channel called #game-club – this is where all your Game Club discussions can take place. If you’re interested, then, follow this link to sign up to the Tired Old Hack Discord server, and join in the conversation. Throughout the month I’ll be jumping in to share little tidbits about the game, and post old magazine articles, be that reviews (so you can see what people thought of it at the time) or tips sections (so you can get help like we did back in the day). The future of Game Club relies on your participation, really. If only a couple of people do it and there’s no real enthusiasm for it, then I’ll scrap it and chalk it up to experience. If, on the other hand, it results in a lovely wee community of like-minded gamers discovering classic games for the first time together, then it’ll continue for as long as possible. If you found Zelda II a bit of a struggle, this month’s game should be a little easier to manage. StarTropics is a bit of a cult favourite among long-time Nintendo gamers: it’s never really rhymed off alongside other classic Nintendo titles, and the number of people who’ve played through it is a fraction of those who’ve played through the various Marios, Zeldas and Metroids over the years. That makes it a perfect candidate for the Tired Old Hack Game Club, especially because it’s still relatively easy to get hold of these days. 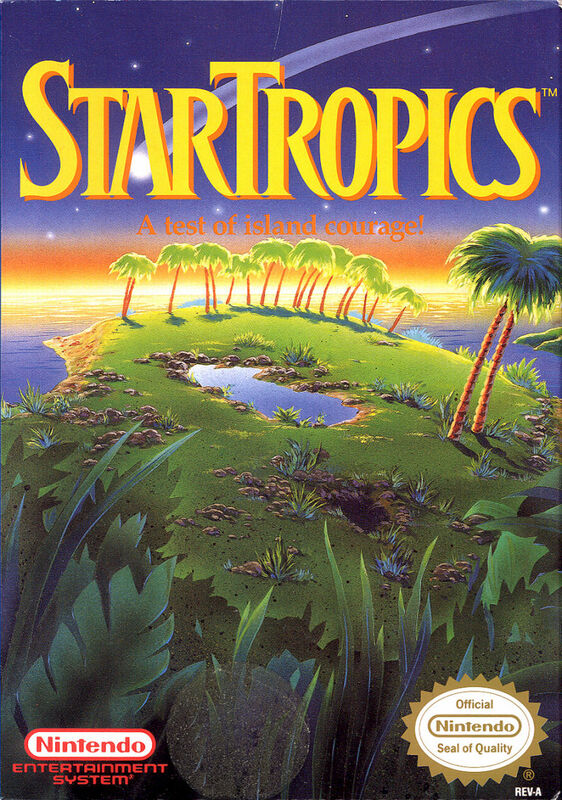 There are a few ways to get StarTropics if you fancy taking part in this month’s Game Club. • If you’re subscribed to Nintendo Switch Online, it’s one of the free NES games available to play on your Switch. • It’s one of the 30 games on the NES Classic mini console. • You can get it on the Wii U eShop for £3.49 / $4.99 (not the 3DS eShop though). • Finally, if you’re dodgy, you can obviously also run it on an NES emulator. Whereas Zelda II requires a bit of reading before you kick things off, StarTropics is far more straightforward, and you should be able to just jump into the action. That said, back in the day people always read the manual before playing, and it would be frankly inauthentic not to do so this time around. With that in mind, here’s the StarTropics manual in PDF form: give it a read. There’s one other thing you’ll need to bear in mind before you play, and that’s the letter puzzle. You see, StarTropics was originally bundled with a physical letter written by the hero’s uncle. At one point in the game you’re told to dip the letter in water to get a special code. Obviously, the problem is that some digital versions of the game don’t let you do this (the Wii U version includes a digital manual along with a recreation of the letter). If you don’t have access to the letter, you’ll be stuck without the code, so here it is: 747. Want to know more about the game before you get started? 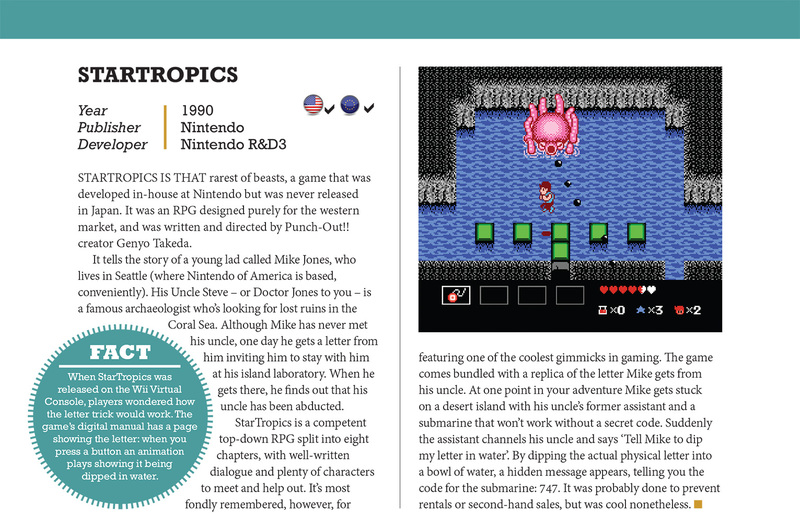 Well, it just so happens yer man Scullion wrote about StarTropics in the NES Encyclopedia, which is out next week. Because I’m a lovely chap, here’s the StarTropics entry from the book. There are 875 more games where this came from! You should now have enough to get started on your adventure. When you’re ready, hop into the Discord server to begin chatting about it with your new Game Club pals: how are you finding the game so far? Have you discovered any strategies to help you in the early stages? Are you stuck and not sure where to go next? NOTE: One final request. If you’ve already beaten StarTropics and fancy yourself as a bit of an expert, by all means take part in the discussions but please don’t try to become some sort of oracle of knowledge. The point of Game Club is for people who haven’t beaten the game before to experience it together: having someone give them all the answers all the time ruins the fun a bit. Besides, nobody likes a smart-arse.